The theme of this episode seemed to be, “Everybody ditch your clothes and take a bath!” No idea whether or not the unwashed Northmen who so offended Lord Tywin’s olfactory sense in “Walk of Punishment” got the memo, though. Arya Just Wants a Family, Damn It! Poor Arya. First Hot Pie left, now Gendry. My heart broke when she told him that she’d be his family, and it broke again when she asked Lord Beric and Thoros if it were possible to bring her father back. I’m finding the Brotherhood’s story line a lot more absorbing on the show than I did in the books. And that was one cool swordfight between Lord Beric and the Hound. Anyone who’s ever drooled over Jon Snow probably wanted to drown Ygritte in that makeshift hot tub. Let’s try to forget about this and move on, shall we? Lord Karstark, who’s been ragging on Robb for a few episodes now, finally takes revenge for the death of his sons by killing the two Lannister boys. Robb beheads him even after his wife and mother warn him that House Karstark will very likely abandon him. And it does. Poor Sansa. She’s dreaming of escaping King’s Landing and marrying Loras Tyrell and living happily ever after in Highgarden, and Margaery encourages her in this. But word of the plan has gotten out, and the future isn’t looking so rosy (sorry, I couldn’t help myself with the pun there) for Sansa. I really, really hate Littlefinger; could he be any creepier?! Yeah, he probably can. We get our first real look at Stannis’s wife, Selyse, who I think was only seen, and very briefly, in the first episode of Season 2. This scene took a seriously disturbing turn, so much so that I wanted to bleach my eyes. We also meet their daughter, Shireen, who sneaks down into the dungeons to visit a still imprisoned Davos. She’s brought him a book, but he tells her that he doesn’t know how to read. In a touching moment, Shireen offers to teach him. This scene was also kind of sad because the two seem to have a connection that Shireen and her father do not. I’m a bit worried about him. In the recap before the start of the episode, there were flashbacks to the Council talking about how Jorah is spying on Daenerys. Ned was in the flashback! Oh, Ned. How I miss you. Anyway, the tension between Jorah and Ser Barristan continues to grow, and it seemed like Jorah was trying to sniff out whether or not Barristan was aware of Jorah’s spying. Jaime, Jaime, Jaime. So broken. His confession to Brienne about what the Mad King, Aerys, was planning to do before Jaime killed him was gut-wrenching and, I think, his finest moment on the show. Ever!!!! Cersei is all giggles over Lord Tywin’s plans to marry Sansa off to Tyrion so that the Lannisters will control the North until her dear old dad turns around and tells her that she’ll marry Ser Loras Tyrell to cement the alliance with that house. Cersei protests, infuriating Lord Tywin. You really don’t want to mess with Lord Tywin, especially when he’s angry. Lady Olenna recommends figs as an essential part of a healthy diet. The Blackfish packs one mean punch! Jon and the Wildlings scale the Wall; Theon’s nightmare is far from over; Robb tries to negotiate with those wily Freys. This was such a great episode! Love seeing Cersei get a little taste of her own vile from Daddy Dearest. Really, what did she expect? She really isn't as smart as she pretends to be. 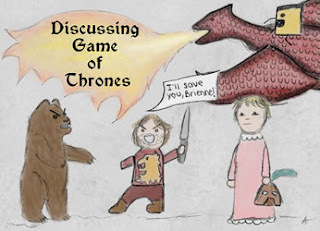 This has to be one of my all-time favorite episodes, especially because of Jaime's confession to Brienne about why he killed the Mad King. Cersei looked so smug while Tywin was ordering Tyrion to marry Sansa, and then their papa turned on her. Brilliant!